Have you ever compared yourself to someone else? It doesn't have to be a famous person maybe a friend or a co-worker? You see someone with a gorgeous complexion or sensational hair and wish you had what she had? For me it started when I was younger. I would say in my high school years. I had low self esteem. I didn't feel pretty, I was awkwardly skinny, had bad hair, acne, not fashionable at all! I constantly compared myself to the other girls. Oh I thought if I only had her hair or her complexion. I wished I had other girls fashion sense. I just wasn't happy with who I was. I didn't feel pretty....ever. I tried to hide that as much as possible from everyone. I put on a happy face but inside my head I kept hearing how ugly I was compared to others. Even when I did meet my husband and for years after we got married I still felt the same way. Always, always, always comparing myself to other women. If I only looked like this, if my hair looked like that, if my body looked like hers. It was never ending in my mind. It wasn't until God helped me realize he made me just the way I was suppose to be. I had to love me for who I was not how I looked. And I had to learn to love my face with it's imperfections, love my hair with this extremely thin self, love my body with all the changes its been through. I had to love me just the way I am. It's extremely important for women to realize if you don't love yourself the way you were created no one else can make you love yourself. No matter if a man tells you that you are beautiful you will question it. Trust me my husband always let me know how much he loved me and thought I was beautiful but because I didn't think it about myself I still had self esteem issues. I need you to do me a favor. Look in the mirror right now and tell yourself "I am beautiful, my face is beautiful, my hair looks good, my body awesome. I love myself. I love everything about my external self. If I want to change something that is OK but I still look good right now, today. I am free from comparing myself to others. God made me in his image and his image is perfect. I love me some me!" My prayer for you: God I pray that every woman that reads this will open her eyes to see her beauty. It is there. You made her in your image, help her to see that every time she looks in the mirror. I pray against negative thoughts and comparisons. I pray against low self esteem. I pray she loves herself the way she is suppose to. I pray she sees you when she looks at herself. Amen. Sometimes you just have to shut up. I know we are not supposed to say shut up. It's not polite. We teach our kids not to say it. But this is what God told me to do. Shut Up. You see this is a long way from where I use to be. When I would get all in my feelings as people say I would say things I should not say. Can you guess who the main target was? My husband. While I struggle to tell others how I feel I have no problem telling my husband. Nine times out of ten this will cause an argument. But this day...this day I heard God say Shut UP! Oh I had a lot I wanted to say. It kept playing over and over and over in my mind. Have you ever done that? You knew you had some stuff to say and it was on repeat in your mind. And if you did say it how did that work out for ya? I know for me it doesn't ever go well. You see I needed peace this day. That was the only way it would end well. If I really said how I was feeling in that moment I shudder to think about the ending. Don't get it wrong peace did NOT come immediately but I kept talking to God. I let him know how I was feeling and I told him YOU have to help me. God you have to wash me in your peace, wrap me in your comfort. You have to close my mouth. Do not let me be a fool with my tongue. I have been a fool too many times with my tongue. I let my feelings control my speaking. Far too many times I have let my feelings speak before I let my mind process. Has that ever happened to you? God 1 - Chandra 0. Yippee God!! Proverbs 29:11Living Bible (TLB) A rebel shouts in anger; a wise man holds his temper in and cools it. Proverbs 21:23Amplified Bible (AMP) He who guards his mouth and his tongue keeps himself from troubles. Philippians 4:7Amplified Bible (AMP) And God’s peace [shall be yours, that [a]tranquil state of a soul assured of its salvation through Christ, and so fearing nothing from God and being content with its earthly lot of whatever sort that is, that peace] which transcends all understanding shall [b]garrison and mount guard over your hearts and minds in Christ Jesus. Disappointment-the feeling of sadness or displeasure caused by the nonfulfillment of one's hopes or expectations. Have you ever had a disappointment in your life? It could have been a failed relationship, a job loss or even a death. We have all faced a disappointment at some time in our life. I fully expected to be pregnant at my God's Leading Ladies graduation. I found out around the middle of the program I was pregnant. Even unplanned pregnancies are joyous. I was excited to know that I would have a watermelon I mean baby bump at graduation. I had thoughts of walking to the stage with a good size belly and taking pictures with a baby bump. Knowing I had a little human growing inside me was exciting. My pregnancy with my son Zechariah was smooth sailing. Morning sickness nope, complications nope. It was an exceptionally uneventful pregnancy. Well almost, he did decide to come 3 weeks early. One day Z (as we call him) pointed at my belly and said baby sister. It was too early in the pregnancy for us to find out what we were having and I just knew my little boy was a prophet. The day came when we went to the doctor to find out and he quickly said it’s a boy. Wha? Since he didn't print an ultrasound picture to prove it with the little arrow pointing to his goods, you know what I mean...lol, I just knew he was mistaken. My husband can attest that I am not a patient person but that's a whole other post. Anyway I just had to find out for sure. Without a shadow of a doubt ya feel me? So I made an appointment to one of those Ultra Sound places that reveal the gender. We were so excited! Much to our surprise they said it was a boy also! Wha? We were good though. Our only concern was a healthy baby. August 26th, 2014 was one of the scariest days of my life. I woke up during the night to use the restroom and there was blood, lots and lots of blood. My husband took me to the emergency room where the ER dr. pretty much thought I had a miscarriage because I was still bleeding so much. After an ultra sound confirmed the baby was ok they realized I had bleeding near my placenta and my cervix was also shortening. Both could cause me to go into early labor so I was put on bed rest. My husband and I prayed and believed everything would be ok. I wasn’t even sure if I would be able to attend the GLL graduation. I decided to go ahead and get a dress just in case I could attend. I found a dress that fit perfectly over my baby bump and accentuated it just perfectly. I was so excited…. Then September 10th came and my stomach started hurting. Not a normal hurt though. It was different. I told my husband something didn’t seem right so we went to the emergency room. Sadly the stomach pain turned into full blown labor at 21 weeks. I delivered Joshua Caleb Harrington at 8:13 pm. He was 1lb 2oz and almost a foot long. The Dr. said since he was not at least 23 weeks they could not save him. He looked perfect, he had a heartbeat but they could not save him. I don’t know why this happened. I do trust God because he is sovereign. But I am human and I was disappointed, sad, hurt you name it and I felt that emotion. My husband and I prayed that everything would be ok and we would have a healthy boy but we didn’t. Have you ever prayed for God to do something and the very opposite ended up happening? Even in our disappointments, our hurt and our pain we must know that God is for us. We must trust him even when we don’t have all the answers. He knows all and we do not. I promise his ways are far better than ours. 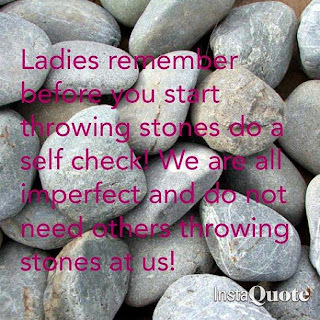 Let's uplift one antoher not throw stones at each other! Why did you fold the paper that way? Why did you answer the phone like that? Why did you wear that? Why did you say that? Why...Why...Why? Have you ever felt this way about other women you are around in your daily life whether it be family, friend, co-worker or fellow church member? I can't lie I have. So many times if we are honest with ourself we feel this way. If it's not the way we would do it then it must be wrong, right? We really should allow people to be them selves. Thank God we are not all the same. I mean how boring would that be? We are all unique and do things different and we must learn to embrace that. Your way may not be my way but if it works for you that is Great! I love the fact we do things differently and who knows maybe I can learn a thing or two from you! P.S. This could apply to marriage as well right honey ! Have you ever been in a position that makes you uncomfortable? It's like a little weight gain and your pants are too tight. You have two options. Buy new pants or do the work it takes to fit into your pants. The easy option is to go buy new pants. But do you really want to conform to the uncomfortable until that is comfortable? Or do you want to take charge and change yourself? Changing your circumstances or situation is not always easy. Sometimes we do not always understand what is going on but we must trust GOD. It's been a loooong time. I gotta get back in the swing of things! I will be posting on here so stay tuned!! I live in Texas with my husband. We have one child and a boxer. I love being married to Dos as everyone calls him. I will someday be a published author. I am a wife, mother, daughter, sister and friend.